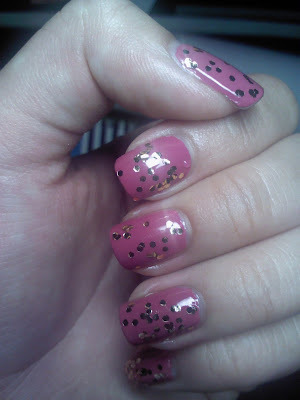 Love, Varnish, chocolate, and more...shows us her SOPI stamped nails. My Polish Adventures swatches China Glaze Hologram collection. Wacky Laki shows us her striped nails using NOPI Modern Family polishes. Rachel Marie's Nails swatches Studio M Fast Play. Lissa's Polish Addiction teaches us how to do recreate her Pink Lemonade gradient. Spektor's Nails shows us her turquoise stone nails. Pretty Little Bottles shares with us her blue Valentine's nail look. in a nutshell... shows us Hard Candy's new nail polish line. Lacquered Lover swatches China Glaze Avant Garden collection. Smashley Sparkles shares with us her animal print nails. Manicure Description: I used China Glaze Life Is Rosy as a base polish and Faceshop Face It GL112 as a glitter on top to layer it. 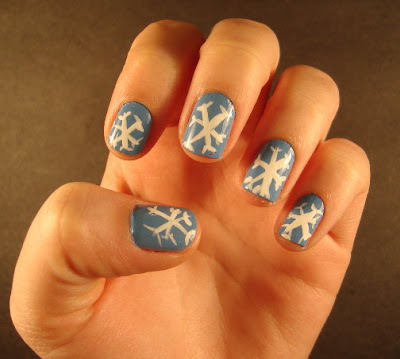 I need manis for February! You can find information on how to submit your manicures for Sunday posts here. Thanks for the link love honey!